Every action has a consequence, although not all consequences show up right away. How do you tell the difference between someone who is genuinely devout and someone who pretends to be pious for social or financial reasons? This question was returned to again and again during the course of this tale. One of the things I appreciate the most about the science fiction genre is how willing it is to explore potentially controversial topics like this one without insisting that everyone come to the same conclusion. What was particularly interesting about this line of thought, though, was how it was woven into such a fast-paced storyline. Not every novel that asks philosophical questions dwells on them. Sometimes bringing these things up to begin with is more than enough to make a reader consider all of the possibilities. Many of the characters had fascinating backstories, but I had a hard time figuring out what their personalities were like or how certain events affected him. This was particularly noticeable when it came to Buddy. Even though he was the protagonist, I never felt like I got to know him as well as I would have expected for a full length novel. Had I known more about his personality and personal growth, I would have felt comfortable giving this story a much higher rating. The title and premise of this book were both definitely eye-catching. As soon as I read the blurb, I knew this was something that I wanted to read. Mr. Whitaker takes a playful, tongue-in-cheek approach to topics that are usually only discussed seriously, and he does so effortlessly. I’m drawn to this writing style and will be keeping an eye out for what he comes up with next. 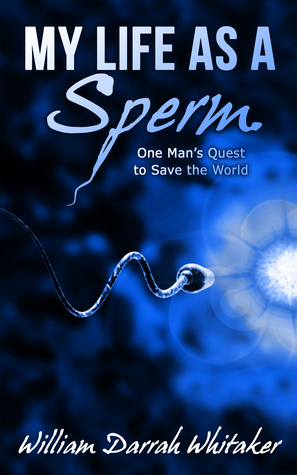 My Life as a Sperm was a fun ride. I’d recommend it to anyone who prefers their science fiction to be cheeky and imaginative.